I am no productivity guru. I am a writer, a church leader, a husband, and a father—a Christian with a lot of responsibilities and with new tasks coming at me all the time. I wrote this short, fast-paced, practical guide to productivity to share what I have learned about getting things done in today’s digital world. It will help you learn to structure your life to do the most good to the glory of God. 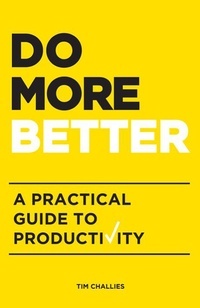 - And much more, including bonus material on taming your email and embracing the inevitable messiness of productivity. It really is possible to live a calm and orderly life, sure of your responsibilities and confident in your progress. You can do more better.